Excellent repetitive precision and short cycle times - these are features that are highly valued by users of plastics processing and die casting machines. They require optimum interaction between the control system and the hydraulic and electric actuators. At the same time, there is an increasing need for freely combinable functional modules for hybrid machine concepts. 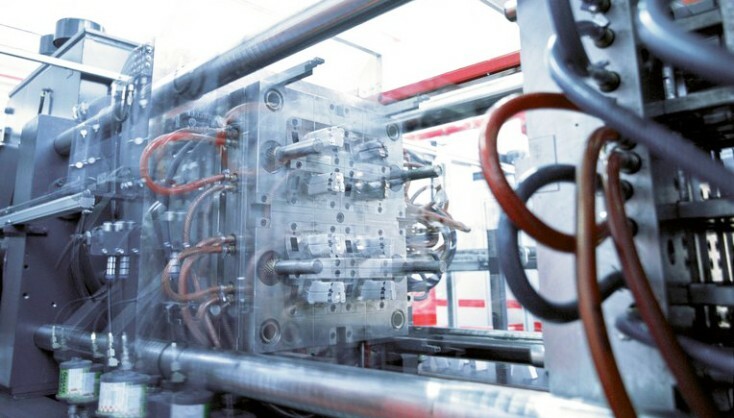 Bosch Rexroth develops components specifically for die casting machines which have pre-parameterized functionalities and custom-designed combinable automated drive systems. Manufacturers can choose between hydraulic, electric or hybrid drives – open interfaces allow for flexible implementations. With pre-programmed functions, even complex motion controls like those used in plastics processing and die casting machines can be configured with ease. Bosch Rexroth employs modern fluid technology, electric systems and multi-technology solutions. The combination of robust hydraulic drive technology and digital control systems opens up new possibilities for manufacturers and users. Special pumps for use with HFC fluids deliver excellent performance through long lifespans and have injection valves with high repetitive precision and great dynamics. This leads to increased productivity and availability of the machine. With our Syntronix variable speed pump drives, for instance, users can reduce their machines' energy consumption by up to 80 percent. At the same time, they are also reducing the noise level. In addition, the components can be easily integrated in new machine concepts and combined with other modules. And since they are delivered ready to be connected, our automation solutions take less time to install. Plastics processing machines cover an almost infinite range from simple standard applications to large-area multi-component structural parts. The requirements are determined not only by the processes but also by the broad range of applications. From these general requirements, each manufacturer then defines its very own set of specifications. Bosch Rexroth provides everything from highly configurable hydraulics components and electric drive systems to modules with pre-parameterized functionalities to multi-technology system solutions. We are the only ones to offer all drives and actuators from one single source. Your benefit: the various Rexroth components work together in perfect harmony. Bosch Rexroth is shaping the trend towards hybrid and fully-electric plastics processing and die casting machines by electrifying hydraulic systems. Manufacturers in 80 countries can rely on our multi-technology experience in order to make their production more flexible and profitable.